Simon Chesters-Thompson is curator and was involved in the Trust's acquisition of Stoneywell. ‘Donald Gimson is still very much involved, which is wonderful,’ he says. The Charnwood Forest in Leicestershire is an area of ancient rocky outcrops, dotted with trees and woodland. It’s a wild and remote environment, perfect for childhood adventures, and one that presented a picturesque escape to Sydney Gimson, just 10 miles from the smoky town in which the industrialist ran the family’s iron foundry. Having bought a plot of land, in 1898 he engaged his younger brother, Ernest, a leading light in the second generation of Arts and Crafts architects, to build a summerhouse to where he, his wife Jeannie and their two sons would decamp during the warmer months. Constructed from stone largely gathered from the garden, and slates from a nearby quarry, Stoneywell is inspired by the landscape in which it sits,and embodies the Arts and Crafts philosophy of the use of local materials and a return to a simpler way of life. As you wend your way through the garden path and top the brow of the hill, the house that Ernest created is seen ahead, emerging half borne out of the bank.The property remained in the Gimson family until 2012 when Donald, Sydney and Jeannie’s grandson, approached the National Trust to continue its care for the future. How would you describe the property? It is set in this extraordinary landscape and appears to have organically grown, zig-zagging from the bank. When you go inside, it’s not a large property, but because it is on six slightly different levels, laid out in an irregular shape and with concealed stairwells, there is a sense of being somewhere larger. The position of the windows is designed to give you different views, so it takes a while to work out where you are as you walk around. You can step out of the window of the main bedroom as the slope of the hillside rises to meet the first floor, so there is almost a seamless transition from house to environment. Ernest was indulged by his big brother, who gave him free rein to create something truly vernacular. Sydney’s initial suggestion was to build the house on a flat site, which had a nice view, but Ernest wanted to build it on the plot’s far edge, which involved buying more land. The rationale behind this was that it should appear as if to have emerged from the earth, and this is why it is so architecturally important. In my opinion, Ernest was founding this natural style of architecture, totally rooted to the landscape, which was taken on as Organic architecture by people like Frank Lloyd Wright. However, you do pay a price for this style: because of the cottage’s sinuous form coming out of the bank, the gable wall can be damp; and it is a bit cold. Even in 1905, Country Life reported the occupants had to “suffer for its beauty”. Where is the Arts and Crafts design philosophy evident? 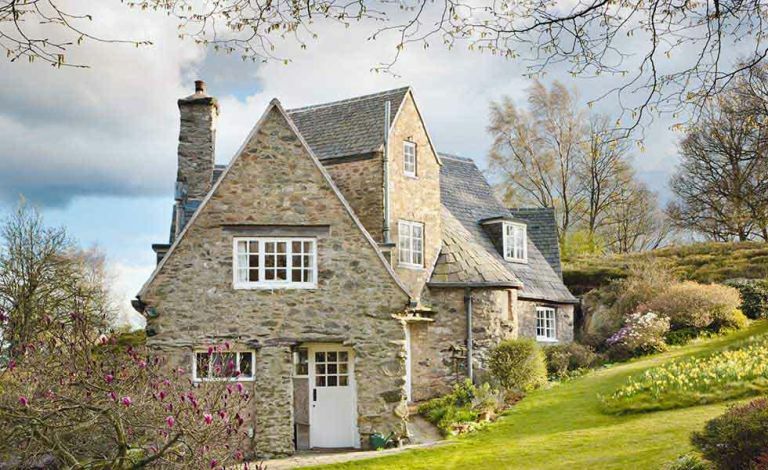 It’s a deceptively spare design, but is arguably the apogee of the Arts and Crafts movement. For instance, the slate shelf in the sitting room was about to be chopped flush by the stone mason when head mason Detmar Blow said to ‘leave it – it’ll serve for Sydney’s smoke shelf.’ So there is that attention to detail but on a very human level. How is the house presented today? Not a great deal had happened to the house since it was built – other than the original thatched roof was replaced with Swithland slate in 1939 following a fire, a bathroom added in 1938, and kitchen in 1953. We had some wonderfully arcane debates as to how to present it. One very academic view was that we should show Stoneywell at the moment Donald left it in December 2012, but we felt this was too long after the children left. Others advocated that we return the house to how it was when Sydney and Jeannie first holidayed there in 1899. This would have meant re-thatching the roof and removing later historic fabric that, from the view of conservation ethics, would have been quite wrong. So we decided to show the house in the late 1950s, as it was when Donald moved there with his wife and young son, Roger. What work was done to return it to this era? This entailed removing the 1980s radiators, reinstating the fireplace, and we also replastered with hydraulic lime plaster, which will dry even in damp conditions. Over this we have applied 13 coats of limewash, which will be an ongoing maintenance job. We removed the more modern shower in the bathroom and I bought a 1930s cast-iron bath on Ebay for about £40 – which then cost £120 to deliver! It was astoundingly heavy and tricky to move up the winding staircase. There is a real sense of childhood fun and school holidays re-created. Donald’s son Roger used to have a model railway in his bedroom, so with this historical precedent I was able to seize the opportunity, and at last indulge my own little fantasy in setting one up! Is the furniture in the cottage original? Most of the furniture is original, and was commissioned by Sydney and Jeannie. Rather than bring in unwanted pieces from their townhouse in Leicester, they wanted to source and have furniture made in the same spirit as Stoneywell. So they opted for practical solid pieces that wouldn’t suffer when the cottage was left unoccupied, and much of it was made by Ernest and his Arts and Crafts collaborators in the Cotswolds. It is this fantastic example of the marriage of the contents with the property that makes Stoneywell so important. Stoneywell reopens in February; visits by pre-booked tours only. Admission: Adult: £9; child, £5; family (2 adults, 2 children), £22. Location: Ulverscroft, Leicestershire LE67 9QE.